Last week the European Commission triggered Article 7 of the Lisbon Treaty against Poland citing the country’s breach of common values and rule of law. The European Commission’s patience has been tried over the past two years as Poland’s ruling majority has increasingly taken political control of its judiciary. In a statement the European Commission said, “Despite efforts for a constructive dialogue for 2 years, we have concluded that there is a clear risk of a serious breach of the rule of law in Poland.” This is the first time Article 7 has been triggered. For now, the action is just a warning shot, but it could lead to suspension of Poland’s European Union voting rights. After scandals hit the centrist Civic Platform party, Poland moved to the right by electing to power the Law and Justice party (PiS). PiS ran on an anti-corruption platform along with tax breaks and greater child-care benefits for the poor. An important part of its party platform was to protect against interest groups such as banks and foreign businesses which it feels have corrupted the system since the 1989 revolution that ushered in democracy. Part of PiS’s argument is that the court system also is part of the corruption and that their efforts are helping to make the courts more accountable and serve all Polish people instead of just the elites. So far, this point of view has resonated with the people of Poland. It also has certainly helped PiS that since it took power the Polish economy has fared well. The triggering of Article 7 by the European Commission poses risks, and those risks seem to favor Poland versus the Commission. 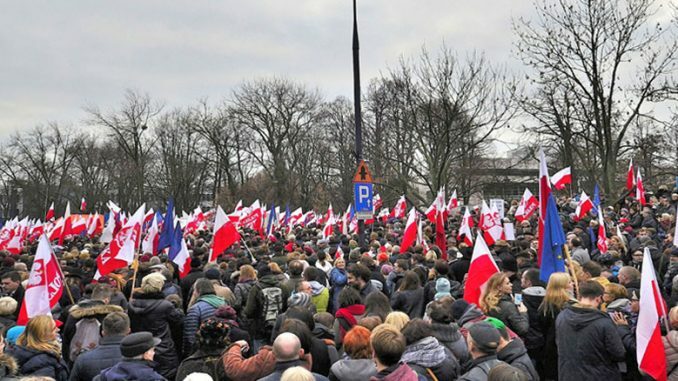 For one, even though the European Union is still popular in Poland, the Polish government is also just as popular, though national sovereignty is important and for very good reasons. Hitler and Communism remain very dark chapters in Polish history and they will not soon forget. This play’s into PiS’s hands. It forces their opposition to have to choose sides between backing Brussels or backing the Polish government and further strengthening its popularity. No doubt, PiS will exploit this predicament to its political advantage. There is some talk even of Poland leaving the European Union in what is being termed as a Polexit. So what happens next? The European governments will summon Polish representatives to explain their actions when it comes to politicizing its judiciary. It will take a four-fifths majority (22-27) to determine if the Polish government’s actions are a risk to the rule of law. The so called “nuclear option” would occur when a unanimous vote is held inside the European Council to strip Poland of its European voting rights. Poland does, however, have an ally that promises to veto the vote, and that ally is Hungary. Hungary is also ruled by its own right-wing party and has been pushing back against Brussels. Both Hungary and Poland are pursuing self-styled “illiberal” agendas leaving some pundits to claim that despite pursuing similar polices, Poland comes under much harsher fire than does its Hungarian friends. But with a promised veto, the European Commission’s triggering of Article 7 appears rather pointless. The hope is that other European capitals will be able to convince Poland to seek less authoritarian measures with its judiciary. It remains to be seen if that gamble will work and if it does not work, the Commission does not have many other options to reign in Poland. If the gamble backfires, the Commission inadvertently strengthened Poland’s authoritarian tendencies making the headache worse.